the long journey to economic empowerment for women in rural Africa. The film will show the interdependence between the two and how elephants and women can support each other for their very survival. Director Louise Hogarth was first inspired to make a film focused on elephants when working on her film, Angels in the Dust, in South Africa. Angels in the Dust is the true story of Marion Cloete and the orphans she cares for. 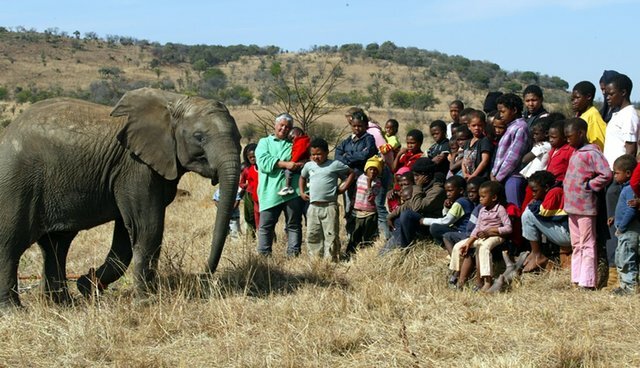 The stories of the children are interwoven with the dramatic parallel saga of the orphaned elephants of Pilanesberg National Park in South Africa. Angels in the Dust had a lasting impact on the Botshabelo orphanage and inspired a series of projects which continue to support HIV/AIDS orphans. Hogarth launched the DO Ubuntu Orphan Bracelet Campaign (OBC) which helps orphans by equipping their primary caretakers with the means to sustain themselves and improve their health. This includes training women to make bracelets to sell for an income. Hogarth intends to do the same in tandem with Do Elephants Go To Heaven?, launching a new social venture to support rural families in Africa. The film will document the creation of a new grass elephant "hair" bracelet and additional products derived from elephant poo, such as notebooks and note cards. These products will support elephant orphanages and local crafters in Africa. The crafters employed through Dream Out Loud Films' projects are some of the poorest in Africa and it is close to impossible to obtain bank accounts for them. The next generation of crafters will be paid with Bitcoin. This process will be documented step by step in the film; woman creating bracelets and recycled elephant poo products, receiving their wages via a Bitcoin wallet, shopping at local stores and entering the new, more secure digital age in rural Africa. DO Elephants Go To Heaven? is currently seeking funding on Kickstarter. A successful raise of $50,000 (or even better, reaching our $100,000 stretch goal) will allow Dream Out Loud Films to continue production on this important film.